Introduction: Bladder cancer is the 11th most commonly diagnosed cancer in both genders. The extent of primary tumour (i.e. clinical T-stage) determines what is the optimal treatment. In recent years, magnetic resonance is gaining importance in terms of clinical T-staging. 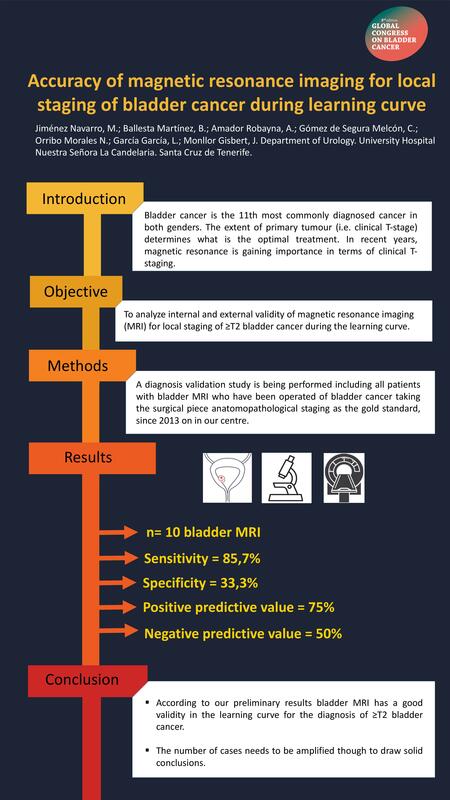 Objective: To analyze internal and external validity of magnetic resonance imaging (MRI) for local staging of ≥T2 bladder cancer during the learning curve. Methods: A diagnosis validation study is being performed including all patients with bladder MRI who have been operated of bladder cancer taking the surgical piece anatomopathological staging as the gold standard, since 2013 on in our centre. Results: A total of 10 bladder MRI have been performed until the date. For internal validity we obtained a sensitivity of 85,7% and a specificity of 33,3%. Regarding external validity, the positive predictive value was 75% and the negative predictive value was 50%. Conclusion: According to our preliminary results bladder MRI has a good validity in the learning curve for the diagnosis of ≥T2 bladder cancer. The number of cases needs to be amplified though to draw solid conclusions.